former adviser to India's Defence Research and Development Organisation, Deputy Chairman of the Prashanti Council. He currently teaches at the Institute and is Director of the Prashanti Digital Studio and Radio Sai Global Harmony. Dr. Venkataraman has taken upon himself the role as the principal Sai official defender on the Internet of Sai Baba against world-wide allegations of sexual abuse, being an accomplice to murders and their cover-up, fraudulent claims of materilisations, many documented lies, false promises and self-serving predictions and massive, unsurpassed, self-aggrandisement. Not exactly a hard-up man by any measure - Dr. Venkataraman having held top posts in India - has been given a new, expensive car by Sathya Sai Baba (who himself claims to own nothing at all! Click here to see the official website announcement). This is what devotees donations - intended for the uplift of the poor and suffering - are evidently used for more and more, i.e. helping rich and influential Indians! Dr. Venkataraman should have been too ashamed to accept it or at least had the moral decency to give it to help the poor instead! The following screen captures show two UNESCO pages [both incidentally still on-line - click on the following links UNESCO's Media Advisory concerning Sathya Sai Baba and UNESCO's Note of Withdrawal from sponsorship of a Sathya Sai Baba arrrangement. Dr. G. Venkarataman's attempts to cover up the facts carefully checked by UNESCO with alleging victims of sexual abuse before issuing their advisory. He claimed these URLs were removed after intervention at top diplomatic levels, holding that they defame his Lord and Master, Sathya Sai Baba. 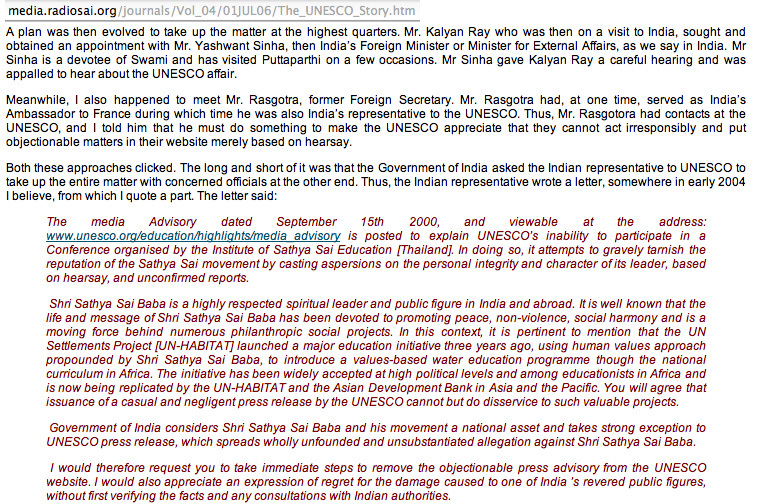 However, the facts as stated by UNESCO to the BBC are that the removal was merely of the nature of a site renovation and that UNESCO does not regret having posted the two pages (screen capture are preserved below, in case Indian minister or their UN Sai-devotee diplomat, Deputy General Secretary Shashi Tharoor, applies to get the archived URLs removed too).